I see things and think......'I like that, I could make it'. Like most crafters and creators, the things I make are generally for other people. A friend spotted this mid-making a few afternoons ago and said, 'That's lovely, you could sell those easily' I started making this little doll for my youngest son's school friend when we were invited to her party, unfortunately, as it was an off-the-cuff idea, I decided the night before to do it, and didn't get it finished. I should say, I have no intention of selling the doll, as the pattern was free, and I totally respect the pattern writer's wishes.....but I have to say, on the subject that I have often thought about, it is very difficult to price an object that has taken some hours of work, but would be worth relatively little, to most. Making a baby blanket is a huge privilege to me, knowing that the blanket may go through life with that person (yes, maybe folded in a box sometimes) ......isn't that special? Isn't it the best feeling to be given something heartfelt? Sometimes, I guess, you may not even know the person that well, but you know they will be touched by the gift and thought behind it.....helping them to feel special when the world is on their shoulders.....or just be so 'them' that you had to make it. I've always been a maker.........it's what I do! That doll is just adorable! I, too, would love to make a little bit of money with the things I make, but for me, the real joy is in creating. Not everyone I make for appreciates handmade, so I have to find the joy elsewhere. I'm glad the things you craft go into appreciative hands! She is so sweet and it's funny because I was never into dolls as a child but she's adorable and that face...TOO CUTE! Maybe it's the "empty nest" thing? LOL! What you wrote about giving and making was beautiful. I couldn't have said it better. She is beautiful. People say the same thing to me about the sock monkeys I make sometimes but I feel that I wouldn't enjoy making them any more if I felt I had to and as they take two evenings each I'd rather save them for special people. I adore her striped tights. I couldn't agree more, especially about the baby blankets. I've still got all the handmade blankets I received from when the children were young and they have been used and loved each time and they will definitely be handed down or on for a long time. What I love the most about making things is giving them to people as gifts. I think it shows so much more thought than running into a shop and buying something for the sake of it. 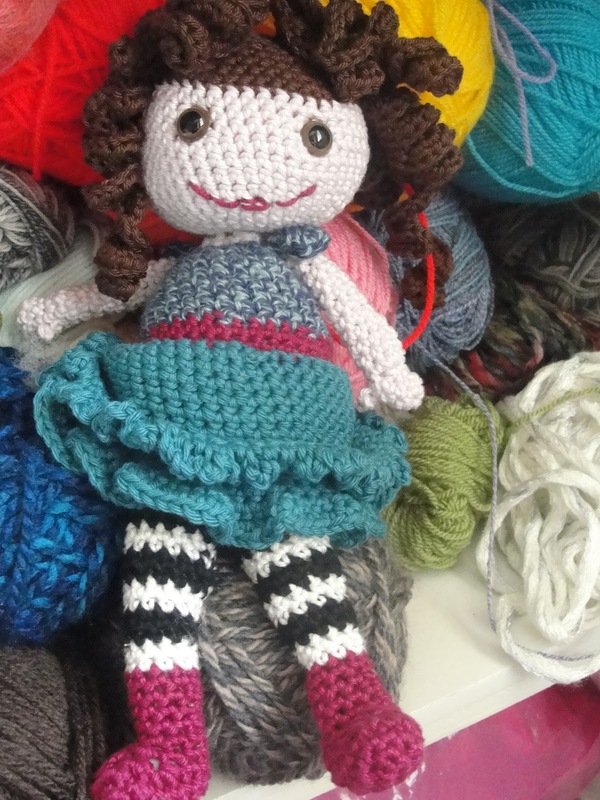 Oh what a beautiful doll Faith its just gorgeous and perfect for a little girl. As someone who loves dolls and have done all my life I think its just divine and I'd have loved one. I get what you say about being a maker, I see something and think I could make that lol. The thing with making things to sell is you will never be able to put a price on the time or effort you put into it thats why they make better gifts for people who'd appreciate them. That doll is so adorable!! Totally agree with you about making for people with love. Such a cutie Faith...She really is adorable and looks as though she has such a very pleasant demeanour too!...I wonder what your boys think of her? I agree that there is nothing more special than a hand made gift...It's difficult to put a price on such things, isn't it?....I always feel very privileged if I am the lucky recipient! Amen to all you said, and all the comments above. The joy is in the making - and having a lot of money involved would probably steal the joy away. P.S. The curly hair is especially cute - and the stripey little tights. Yes; I think it's a gift to be able to be so crafty, esp a knitter or crocheter b/c of the skill and patience. I love how you respect the creator's wishes. There's a big debate about copyright and the selling of FOs in our world. I think the same way; always seeing a pattern and thinking it'd be perfect for someone I know and love, not for myself. Keep that dream alive and start small! That's what I plan to do. You clever girl! 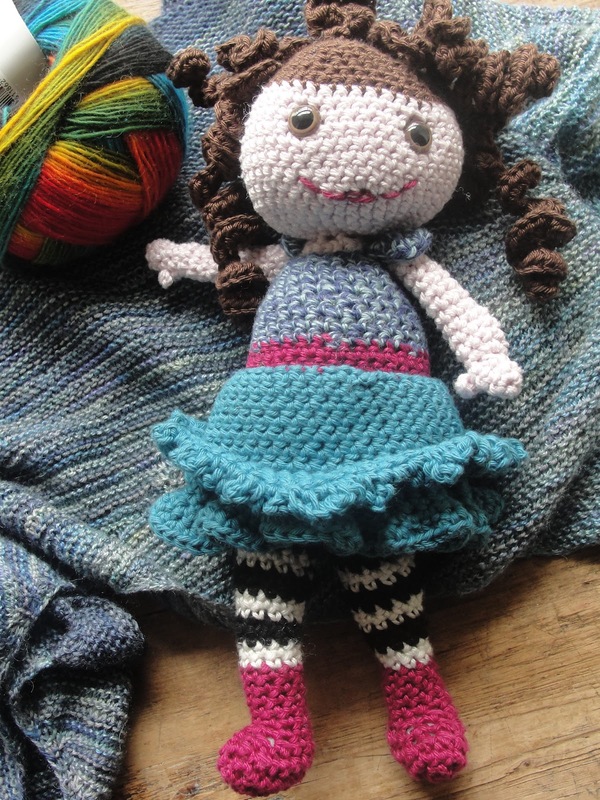 Your doll is gorgeous and anyone who is lucky to receive a beauty like this would treasure it forever. I have to say that this pattern copyright thing annoys me a bit. If you find a pattern for free, I think you should be able to do with it whatever you like. 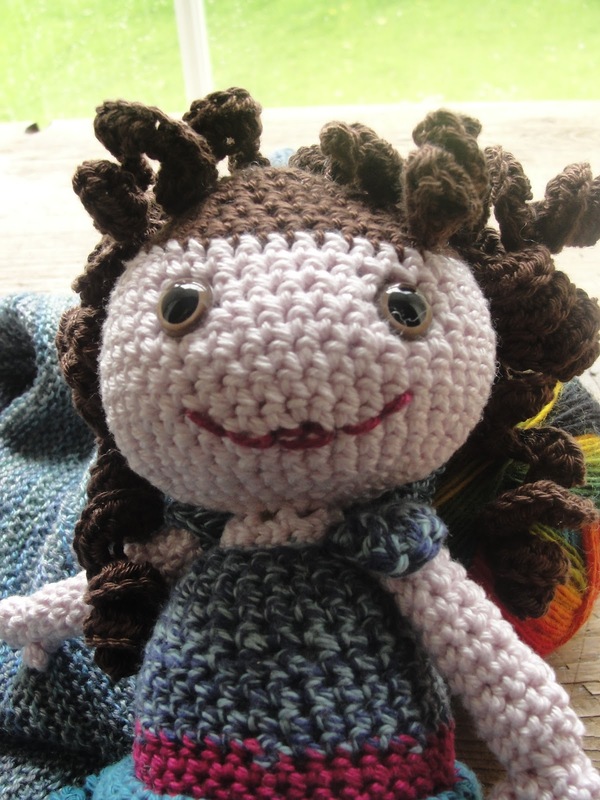 I say "share the crochet love"!!!! I've only created a few patterns and I couldn't be happier if someone managed to make a few dollars from their makes.